Anytime I can put sour cream and cheese on something, I’m a happy girl. I guess that’s why I’m such a huge fan of Mexican food — what’s not to like? Unfortunately though, Mexican food also happens to be one of the worst diet offenders. So when that craving strikes (which it does frequently), I like to play around with different Mexican-inspired ingredients to see how I can satisfy that craving without throwing my entire concept of healthy eating right out the window. This recipe — which contains healthy brown rice, black beans and sweet potatoes — gets a huge punch of flavor from canned chipotles in adobo. If you haven’t tried them before, you must — they’re an amazing way to add TONS of great smoky spice to a dish with hardly any effort. You won’t believe how good they taste when combined with the sweet potatoes. The best part about this dish is that you can indulge in an entire bowl without feeling guilty. Each serving is packed with tons of protein, fiber, vitamins and minerals, so you don’t even have to feel bad about splurging with a little sour cream and cheese. I know I didn’t. Preheat oven to 425 degrees. Line a metal baking sheet with foil and spray liberally with cooking spray. In a large bowl, toss sweet potato, onion, chipotle, adobo sauce, olive oil and salt and pepper to taste. Spread evenly on baking sheet and roast for approximately 25 minutes or until potatoes are browned. After the potatoes have been roasting for 20 minutes, put black beans in a small sauce pan over medium-low heat. Add half of the cilantro, season with salt and pepper, and heat until warmed through. Fluff the cooked brown rice and add half the scallions and the remaining half of the cilantro. Season with salt. Assemble by layering the rice, chipotle potatoes and black beans in each of your serving bowls. Top with remaining scallions, avocado, shredded cheddar and sour cream. This looks soooo good, simple, and wholesome. 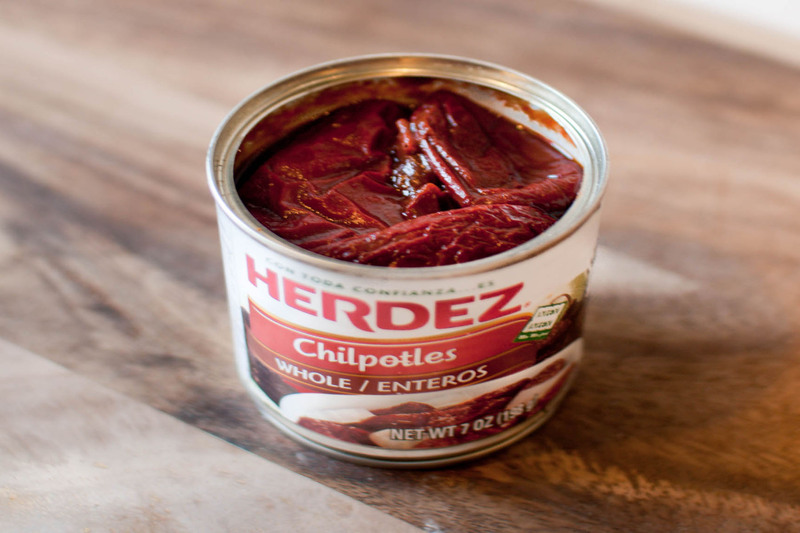 I’m totally hooked on chipotles in adobo and always keep some around…definitely trying this one for dinner! That looks so yummy and very easy (right up my alley). Will definitely be trying this recipe. I agree about the sour cream and cheese and this looks like the perfect place for them! It’s really good as-is, but I couldn’t help but wonder what it’d be like with some chorizo! Love the avocados! They look so fresh. What an excellent, healthy take on mexican food! I’m a big cheese lover too, and all those veggies, yum! Mm, chipotle! I buy the same brand, but have only used ’em for BBQ sauce so far–going to try this! This looks really good! I love the idea of adding sweet potatos. I’m trying to eat way less meat, so love the idea of a hearty Mexican bowl like this. And really, with cheese, avocado and sour cream, who needs meat?! Nice! Thanks for going veg, even if all I’ve wanted all day is a big bowl just full of bacon. Mmm! This sounds really yummy. I love Mexican food and mixing in sweet potatoes and those smokey chipotles in adobe must be delicious. This dish sounds delicious. I would have to sneak it in on a night when BF is out late at school because its not his cup of tea, but to me it sounds amazing. 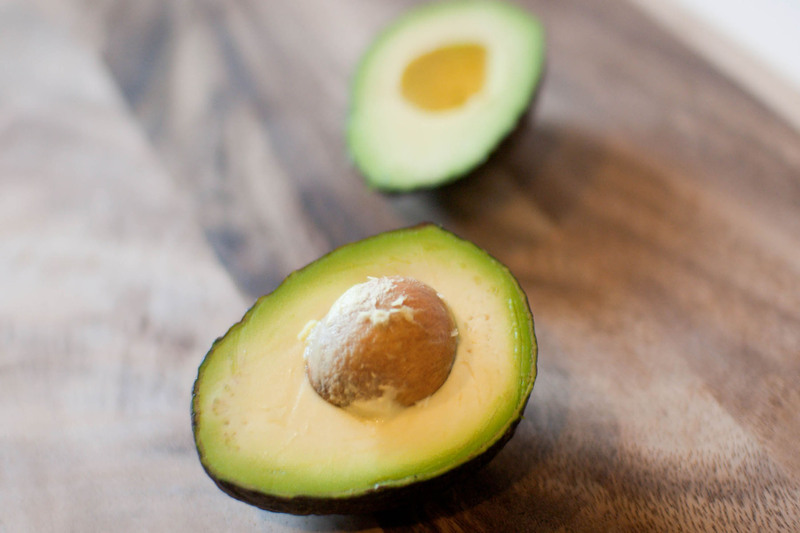 I love Mexican food too – I feel about avocado the way you feel about cheese and sour cream. This looks great, and I love that it has a lot of nutritious stuff in it! I am a huge fan of Mexican food too. I agree that more often than not the options are not healthy. I try to make as much at home as possible to monitor the ingredients. 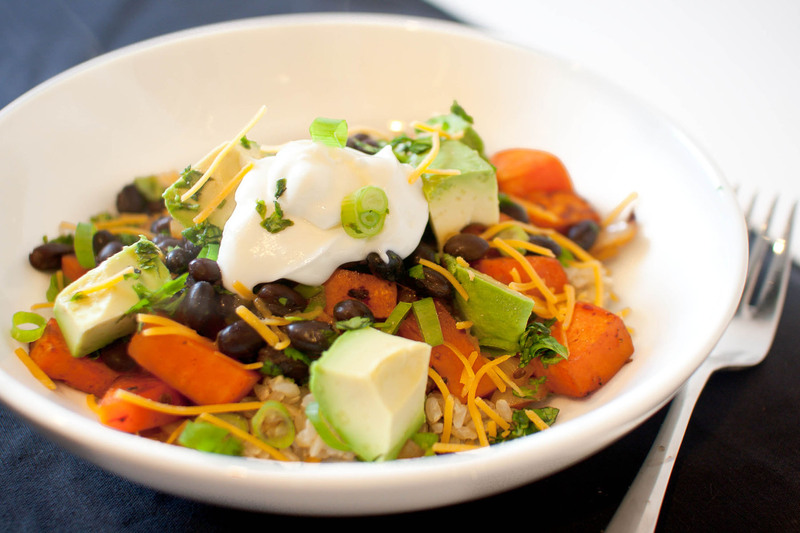 Your dish has some of my favorites: black beans, avocados and sweet potatoes. It looks super good! I will definitely have to try it out. Oh man…that looks utterly delicious! I’m with yah — Mexican food rocks! Hence my quick trips to Cabo all the time! :-p No, but seriously, this looks awesome. I’m about to work out (I checked in 5 minutes ago but I haven’t changed yet…seriously procrastinating lol) and looking at this is making me hungry. I just wanted to say that this website is hilarious on the iPad. I made this last night (with some crumbled chorizo) and it was fantastic. I am drooling over this dish! this looks soooo good…sour cream, cheese, avocado…all my favorites..yummy! This sounds amazing but I’m not a huge fan of sweet potatoes, what do you suggest as a substitute? I’d say regular potatoes would be equally good (I’m a fan of any potato!). You may need to adjust the cooking times, though. Butternut squash may also be a nice option. Actually, I think I may try that next! Looks yummy! I plan to try this today. I won’t be using canned beans however. Dried beans are way cheaper and, I think, tastier. They are easier to haul back from the store on your bike since they are essentially dehydrated. And it makes for easier trips to the recycling facility as there is no can to recycle. A pressure cooker makes preparing dried beans faster and more energy efficient than otherwise. Definitely! I’ve been using dried beans more and more often, too — mostly because of the less waste factor that you mentioned. And as a fellow cyclist, I totally hear you! I made this last night. It was delicious!